just to get his autograph . OMG - I can't believe I am actually on the set of Broken Arsed!! Who knew I'd come this far? Damn, small country hick like me! Wow! Yeehaw! First problem we have is that the peeing sheep is taking its bladder to South Wales for a bloody week! Control your flock will ya?! PM her and arrange something! I don't know that we will get to her part straight away anyhooooo! But if we do, we will have to fill in some of the scenery until she gets back. 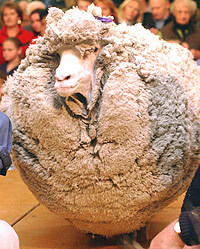 Or perhaps you have some other amazing sheep who can do some fill in tricks until she reports in! BLOODY ACTORS! Sure thing. I just tried to get a hold of Peeing Sheep's agent and all she said was that she was burned out and was taking some time off with her in-laws in Wales. I know it is abit inconvenient, but it won't be too hard to get another sheep with a bladder problem. He is an experienced actor, and he claims that he can pee on cue. He peed 3 times at my request, so I know that he is not lying. Plus, with a little 'make-up', we can make him appear to be a she. I am sure this will work out. %% Gotta prove to these people that I am the bestest goddamn Sheep Trainer EVER! !